On 26.12.2009 was held the traditional Christmas celebration of the competitors of SC "Kyokushin" - Shumen. This merry event around the christmas tree was attended by around 100 karate Shinkyokushin trainees in Shumen and from the branches of the club in Veliki Preslav and Tsarev Brod, together with their parents and senpai. They received a greeting letter from the most successful of Shumen's karatekas - senpai Tsvetelina Marinova, who wrote them to chase their dreams and to never give up. Honorary guests to the festivities were long-time friends of Shumen's karatekas - Plamen Georgiev and Panaiot Kadulov, who once again successfully took on the role of Santa Claus and handed out presents to both the young ones and the old ones. Every karateka, as well as their senpai and parents, had to demonstrate their favourite technique for Santa, in order to earn their gift. In the end Santa himself made an impressive demonstration, to show that he deserves to wear his black belt. The chairman of SC "Kyokushin" senpai Stoian Obretenov treated everyone to banitsa with fortunes and then everyone could try their luck in a holiday lottery. And so, with much happiness and joy, many dances and songs, as a big family the karatekas of SC "Kyokushin" - Shumen ended a very successful year, during which the competitors won a total of 75 medals in all age groups from official tournaments of the Bulgarian Karate-do Kyokushin Federation's sports calendar. From tournaments for cups they have 11 first, 7 second and 9 third places. From Zone competitions - 10 first, 7 second and 8 third. The first event for them in the new 2010 year will be the examination for a higher technical level /kyu/, which will be under the leadership of sensei Valeri Dimitrov and sensei Dimitar Trampov. 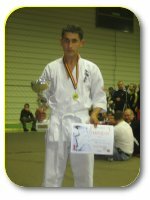 During year 2009 the karatekas of SC "Kyokushin" - Shumen, with chairman senpai Stoian Obretenov - 1st dan, have accomplished a great achievement. 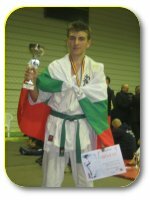 So far they have won a total of 75 medals in all age categories in official competitions from the sports calendar of the Bulgarian Karate-do Kyokushin Federation. Shumen's team also did well at the Eurpoean tournament in Kyokushin karate, which took place on the 3rd and 4th of April in Kiev, Ukraine. In the juniors 55kg category Bogomil Tiholov made a great debut, decisively winning his quarterfinal match by knocking out his opponent from Litva with chudan mawashi geri under a minute. In his semifinal round he faced a competitor of the home country and after a very close fight the judges favored the ukrainian. Shumen's young karateka was one of the youngest and lightest competitors at the European tournament (his weight is barely 51kg), but he gained very useful experience, showing that he has the qualities to fight for a bigger prize next year. The greatest joy for us was brought by Shumen's Tsvetelina Marinova, who won the silver medal in the +65kg category and on 20.06.2009 took part in the World Cup, which took place in St. Petersburg in Russia. The younger generation follows in Shumen's national competitors' footsteps. 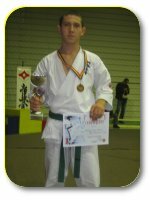 On the International Romanian Open Cup tournament, which was held on 31.10.2009 in Oradeia, Romania, SC "Kyokushin" - Shumen's young talents made an excellent performance, winning 2 gold, 2 silver and 1 bronze medal. 2. Osman Osman, for whom this was a debut in an international event and he was excellent in the juniors 60kg category, consecutively defeating much more experienced opponents from Hungary and Romania./He is on the third photo/ Osman Osman trains in the branch of SC "Kyokushin" in Tzarev Brod under the leadership of Aidan Ahmed. 2. Janet Dimitrova in the kadets 55kg category, who in her semifinals defeated her opponent of the hosting country and then faced a Hungarian competitor in a very close match. In the end the hungarian made a very bad foul against our girl with a hit to the throat, which was her second offense. Also achieved are 11 first, 7 second and 9 third places in National tournaments, as well as 10 first, 7 second and 8 third places in Zone competitions. Over the course of the year 2009 SC "Kyokushin" - Shumen hosted 4 competitive events - the Republican championship for juniors, the Republican tournament for the "Madarski Konnik" cup for adults, the Zone competition in all age groups and the tournament "Shumenska Krepost" for children in 8, 10, 12 and 14 years of age categories. The upcoming events for Shumen's karatekas are the technical exam for a higher technical level /kyu/ and the traditional winter camp, which will be held under the leadership of sensei Valeri Dimitrov - 3rd dan /seven times european champion, twice world champion in the 80kg and +80kg categories, third on the World Championship in the absolute category in year 2007/. the Municipality of Shumen, "Vigor" Ltd. with chairman Mr. Svilen Marinski, 3 S COT, the ICON firm, Mr. Latif Sali Latif, "Strongstroi" Ltd. with chairman Mr. Niazi Ahmed, "Ultima" Ltd., the "Gunchai and Gursai" firm. Shumen's karatekas are grateful for everthing the sponsors have done, for without them Shumen's team couldn't have taken part in all of the strong competitions from the sports calendar of the Bulgarian Karate-do Kyokushin Federation.КК. 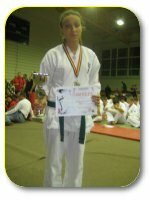 On 28.11.2009 in the "Pliska" hall was held the traditional "Shumenska Krepost" tournament in karate Shinkyokushin for children of 8, 10, 12 and 14 years of age. In 20 categories for kumite and four for kata competed the karatekas from Shumen, Tzarev Brod, Russe, Novi Pazar, Nesebar and Veliki Preslav. Excellent results were achieved by the competitors of SC "Kyokushin" - Shumen, with chairman Stoian Obretenov - 1st dan, who won 12 gold, 11 silver and 11 bronze medals. Deservingly, SC "Kyokushin" - Shumen also won the prize for team standings. Second in the team competition are SC "Russe", followed by SC "Kyokusin" - Novi Pazar in third place. Four of Shumen's karatekas won the prizes for the best technique in their age group - Emil Bachev in the 8 years age group, Nesrin Nejdet in the 10 years age group, Mark Chervenkov in the 12 years age group and Simona Stoianova in the 14 years age group. Champions are: Enis Mustafov, Emil Bachev, Nesrin Nejdet, Dian Petkov, Roberto Vasilev, Mark Chervenkov, Djaner Shukri, Tasin Tasin, Taifun Mehmed, Ivelian Petrova in kumite and Bogomil Tiholov in kata. Silver medalists are: Kaloian Preslavski, Serpil Galib, Kaan Shukri, Radostin Vasilev, Mario Vladimirov, Tsvetomir Genov, Denis Muzikiarov, Iusdzan Eredzebov, Osman Osman, Simona Stoianova in kumite, the last competitor being a silver medalist in kata as well. Bronze medals were awarded to: Pervin Huseinova, Kader Rizaeva, Arzu Fikretova, Simeon Grigorov, Ivan Radoslavov, Alexander Bachev, Kaloian Georgiev, Plamen Rusev in kumite. In kata bronze medalists are Vanio Valchanov, Iordan Georgiev and Mark Chervenkov. The main purpose fo this tournament is to discover young talents. The event has a traditionally great interest from the audience. Many of the young karatekas showed a great technical growth. Sponsor for this tournament was "Vigor" Ltd. with chairman Svilen Marinski.